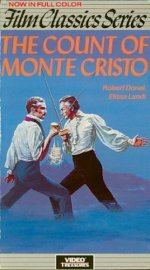 Although written for Fredric March, who pulled out ahead of filming, Robert Donat stamped his mark as the Napoleonic sailor who is framed and imprisoned in the appalling Chateau d'If, supposedly to languish there for the rest of his days. However, he uses his time wisely, coolly plotting to escape and wreak his revenge on those who betrayed him. This handsomely mounted swashbuckler is the best of the adaptations of Alexandre Dumas's celebrated tale and showcases Donat, despite his ailing health, at his charming, romantic best.